Roemheld is renowned internationally as an innovator in workholding and handling technology. As a manufacturer, we are committed to researching and designing technological innovations that are driven by industry need. We supply specialised solutions to a wide range of industries including automotive, aerospace, medical, renewable energy, plastics and rubber, food and packaging. The original Kostyrka clamping sleeve has dominated the European mechanical engineering market as it offers a made-to-order fit for every application alongside lasting reliability and repeatability. This means it can simply be installed and then forgotten. Only available in the UK from Roemheld, the Kostyrka clamping sleeve operates on a very simple clamping principle utilising flexible bushes made from a metal-plastic composite. These are axially held in housings that surround the part, and then clamp it, by applying oil pressure to the sleeve jacket. The oil pressure is converted without any loss or reaction into a radially acting force that clamps without affecting the piece. The sleeves spring back to their starting position once the oil pressure is removed. This enables these computer programmable, compact sleeves to exert extremely high holding forces and to clamp and unclamp at lightning speed. Kostyrka clamping sleeves are available with an inner diameter from 6mm to 1500mm+ and are designed for clamping forces up to 600 bar. As they are specially made, they can be adapted to any installation space and are available in a wide range of versions for absorbing the different torques generated by linear, rotary, axial and tangential clamping forces. Roemheld aluminium vice systems offer lightweight, flexible clamping solutions for horizontal and vertical machining centres. They can improve efficiency, significantly increase capacity and optimise efficiency. The range includes double clamping vices, towers and concentric vices. 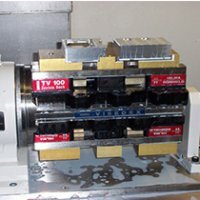 The lightweight twin vice system has quick change jaws that are fully machinable and available in 100mm and 150mm widths. The self-centring vice provides quick, simple fixturing for concentric machining of different sized workpieces. The hydraulic vice column with patented swivel coupling prevents the twisting of hoses and saves time and money. The tower units offer the ability to run a number of customers’ requirements during a single run. 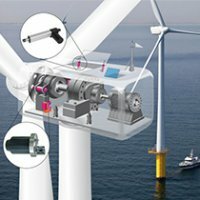 Roemheld’s cost-effective modular rotor locking system is designed to secure wind rotor turbines when maintenance and safety checks are being carried out. 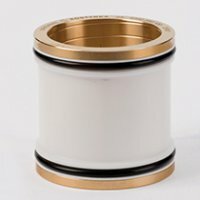 A permanently corrosion-free coating of the bushings prevents rusting between surface intervals and the need for regular greasing. As a result, the rotor lock is pernanently ready for use which also reduces the need for plant maintenance. The surface protection of all rotor lock components corresponds to DIN ISO 12944, C4, so that they can also be used in offshore operations. Non-contact position monitoring has also been introduced to offer longer life and high availability. A non-contact switch checks if the bolt is in stand-by position or if the rotor is locked. 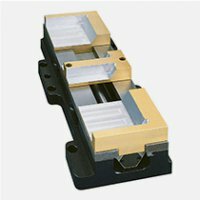 As there are no mechanical contacts to wear out, replacement is not necessary. Roemheld manufactures hydraulically or electro-mechanically operated rotor locks to customer specifications and supplies to companies all over the world. The rotor lock resists side loads up to a maximum of 7,000 kN and can be used to lock the rotors of onshore and offshore wind power plants with up to 6.5 megawatts of power. The locking module, with its compact design, is adapted to the limited space in the nacelle. The use of standardised components makes it possible to produce complex special designs quickly and cost-effectively.